When thinking of the line quality an artist uses one can associate that line with definition, expression and a way to occupy a surface area. 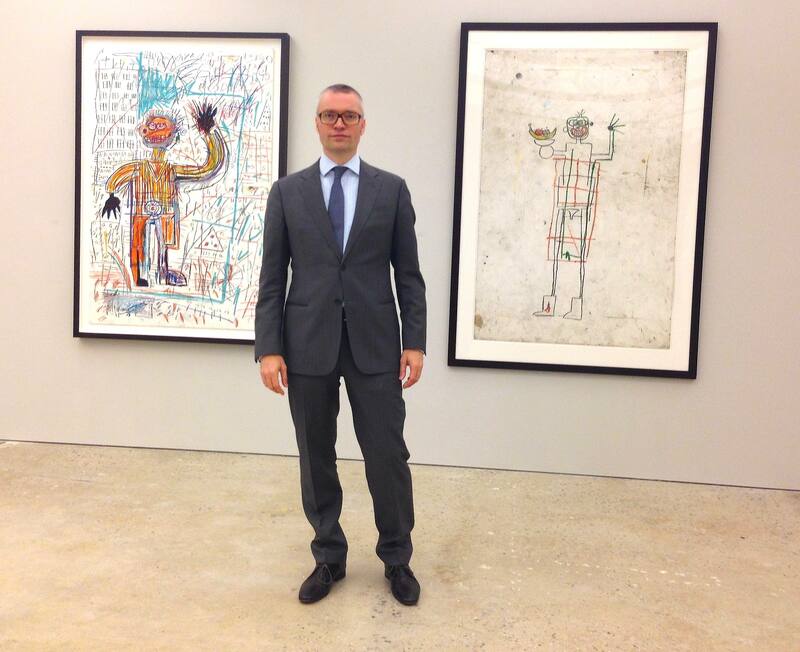 For Poetics of the Gesture: Schiele, Twombly, Basquiat at Nahmad Contemporary in the Upper East Side curator and scholar Dr. Dieter Buchhart organized a show with forty paramount works on paper by Egon Schiele, Cy Twombly, and Jean-Michel Basquiat. The drawings and paintings, most of which were on loan from private collections, tastefully allowed for a situation whereas visitors were granted, through the agenda of the curator, the chance to reconsider the mark-making of these three artists. Bringing together a triad of generations and aesthetics, Buchhart has spent years engrossed in the intricacy and specificity of the line found in their very individualized works. What he discovered is that each artist, in a process ascertained to be a flicking of the wrist, worked the draftsman’s tool across their chosen ground defining the space, whether resulting in the familiar vertical lines of Twombly or the precise gestural marks defining figures captured by Schiele and Basquiat. Leaning closer towards each framed surface, spatially dense areas are composed of many aggressively applied lines, purposeful and decisive. The line of an artist is not unlike the line used in chirography. Whether hieroglyphics, Magic Realism or Abstract Expressionism, the line is a personal signature. Since many of the works of these artists are revered, installation was done in such a way that the paintings didn’t detract from one another but allowed the viewer to conceptually enter the two-dimensional surface. In some instances, the line is used to form words, scribbled in the body of the work and at others meant to be read, interacting with the negative space. Cy Twombly (1928-2011) and Jean-Michel Basquiat (1960-1988) were both born in America while Austrian born Egon Schiele (1890-1918) had passed away before the either artist was born. It could be estimated that Basquiat the youngest of the three, was familiar with both of these artists who came before. Twombly was the generation of Basquiat’s father, while Schiele could have been Twombly’s father. This all spoken loosely of course, since neither Schiele nor Basquiat had children of their own, and both died at 28 years old. One of the beautiful characteristics of draftsmanship, is the way it can function as a child learning a new language. Drawing begs for the imitation of the past, but in a voice that is entirely one’s own. 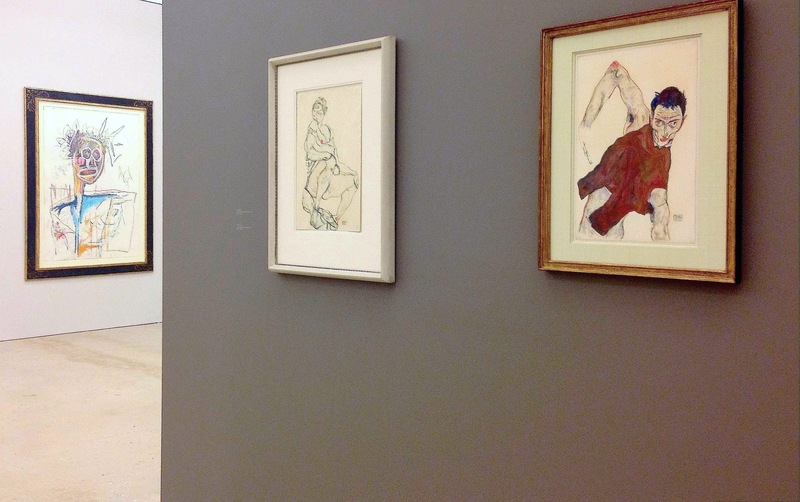 The timeline [between Schiele and Basquiat], would be when Schiele started his work in 1905/06, very early. His main focus was from 1910-1918 when he died. Basquiat started in 1979, although he made some drawings in 77/78 he didn’t arrive at his style until 1979 with what I’d call conceptual graffiti. In 1980 he started doing works on found canvas, doors, etc. When he started working with Annina Nosei Gallery [then in Soho], he was connected more so to the museum and gallery worlds. He did silk screens in 83/84 and his style changed in 1987 until his death in 1988. In 1910, when looking back, Vassily Kandinsky and others were heading into abstraction, however leading the track of Modernity. There is a very interesting meeting point between these two artist’s (Schiele and Twombly) and Basquiat, who was in a moment best described as Post-Modernism; collaging everywhere and combining everything, including movements such as Pop-Art. Because of the format, the show is very much about measure. Including late work by Basquiat would have brought in an entirely different level of aesthetics which I didn’t want. Each artist has a different style, but in the sense of Basquiat you can see the correlation between the three artists in [his work made from] 1981-1983. When comparing line and drawing between these three artists, specifically Cy Twombly and Jean-Michel, we can recognize their use of letters, specifically Basquiat who was referencing Hip-Hop, noise music, and John Cage. There is a quite a correlation between the auditory messages in the work, Aaaaaaaaa in Basquiat drawing, and Kurt Schwitters who investigated sound as medium. 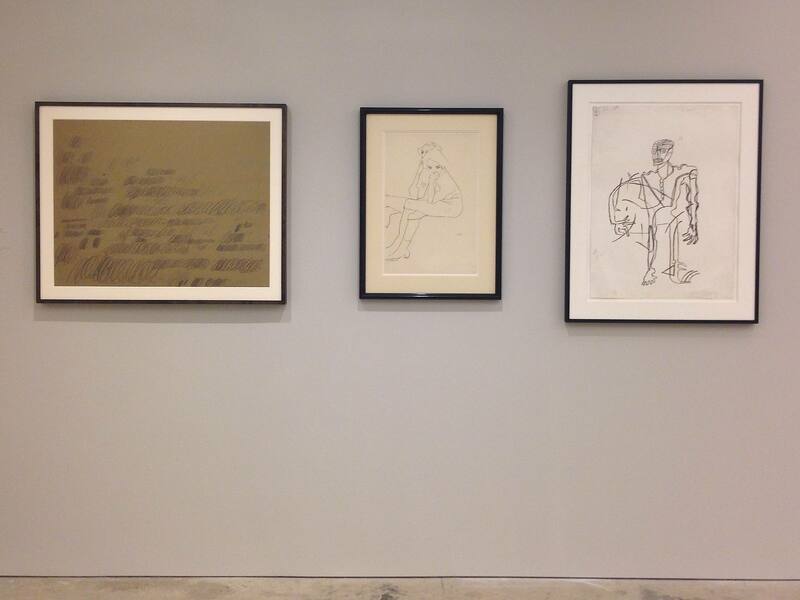 Poetics of the Gesture: Schiele, Twombly, Basquiat was on view May 2 through June 14, 2014.